Highest Quality Foam Balls on the Market! Premium Gator Skin® Balls - Your BEST choice. Durable and easy to grip. Low bounce, low density, low rebound. Our softest ball is best suited for Pre-K and elementary aged kids. 8" diameter, 25 kg density foam. Red only. Certified Latex Free. Non-sting coating is a proprietary polyurethane. We're so sure that our Gator Skin® balls are the highest-quality coated foam balls on the market, we back them up with a 4-year guarantee! The tactile, non-sting coating makes them easy to grip, and the coating is so durable, they're virtually tear-proof! No more red marks from the stinging hit of a vinyl- coated or rubber ball, so everyone can play at ease and gain confidence. That means more fun during more activities. Our premium Gator Skin® balls are simply your BEST choice. NOTE: This warrantee does not apply to commercial use (for example, trampoline parks). Gator Skin® is a registered trademark of S&S Worldwide. Any use of this trademark without express written consent from S&S Worldwide is strictly prohibited. 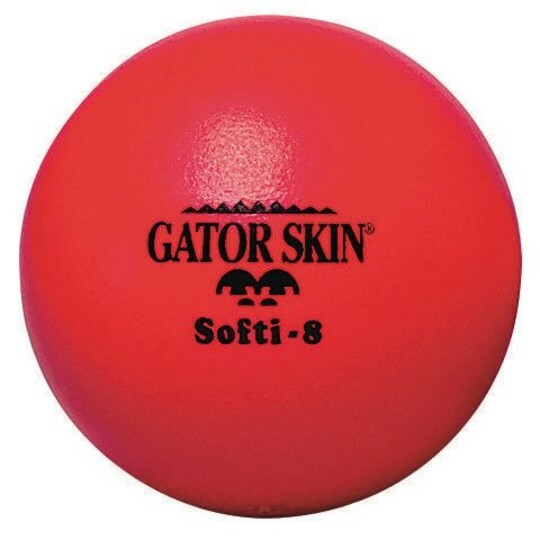 Gator Skin® is the original coated foam ball enjoyed by millions of satisfied customers. Seems like a sturdy ball but haven't actually used them yet! So far the best lasting dodgeball brand that I have tried compared to other websites.